Darren Collison suffered food poisoning over the weekend and was admitted to the emergency room on Sunday. He received intravenous fluids to treat dehydration. The junior point-guard missed practice on Monday and was not expected to practice Tuesday, however, UCLA Coach Ben Howland said Collison should be available to play against the Washington Huskies on Thursday. Howland was pleased with Collison's play against California especially on the defensive end. "He played very well on Saturday," Howland said. "I thought it was his best game of the year. All those little pull up jumpers he hit, those are great shots. He played great defense. One thing to never lose sight of is his defensive intensity on the ball. His ball pressure is as difficult for anybody in the country to deal with." Although sophomore James Keefe played a total of just eight minutes in the Bay area games, Howland was very pleased with his contributions. "He is so much further ahead than he was last year," Howland said. "His minutes were critical in the last game. He's going to play a critical role in the remaining games we play. I don't think he's as strong as he was before he hurt his shoulder, but I think he's pretty close." Michael Roll is wearing a walking boot as he recovers from his foot injury. He is scheduled to be out at least another 3 to 4 weeks. Howland made it clear he had no plans to redshirt Michael Roll and anticipated his return to the lineup later this season. On losing recruits to the basketball program, Howland said it was all part of the recruiting process. "In recruiting you lose a lot of guys you go after. You can't lament to much on what could have been," Howland said. "Actually, I lament more about what it would be like to have a guy like Kareem Abdul-Jabbar here again or a Bill Walton. I think about things like that - where is the next Bill Walton." Man. Collison has had a rough season. Messed up knee, then ankle, now food posioning. His game is not what it was last year (due to missing time, the injuries, and I think the media got to his head a bit). Good news is that at this point - I would say he returns for another year - but with so many guards coming in next year - maybe that's not the case. Would be great if the "old" Collison showed up in time for the Big Dance. Regardless, even an average Collison is better than what most teams field on game days. Go Bruins! Larry, I agree that at this point Collison might be leaning toward staying another year considering the unexpected adversity. It could all change with a strong finish to the year, but then he'd still have to compete with a deep class of point guards -- Eric Gordon, Derrick Rose, DJ Augustin, Ty Lawson, OJ Mayo -- which might make it difficult to secure a 1st round guaranteed contract. There would be a significant logjam at guard for us next year if Collison returns, but I could imagine Jrue Holiday stepping into Josh Shipp's role on the wing with Collison and Westbrook playing the guard positions. I think people forget how much production we are getting from Shipp, Love, and Westbrook. DC is very productive, and it seems clear that his role will be more limited this year than last, by default. UCLA has a lot of great scoring options, and in my opinion, injuries aside, Collison is having a very fine year, KL has replaced him as our All-American Candidate. In regards to the NBA, I think he is gone. No doubt in my mind. I think the chance of him coming back next year is incredibly slim. In sum, we don't need Collision to average 20 points and 8 assists a game, there are plenty of weapons on our team, and the more balanced, the better. 12 & 4 is just dandy. I think DC is gone for sure as well whether he's a projected late first rounder or lotto. He almost left last year...I think his mind is set. Could you imagine how crowded our backcourt would be next year if DC stayed??? DC, Westbrook, Jrue, Jerime, Lee, Roll, possibly Shipp!!! Depth is nice but that much talent on the bench would be harmful to team chemistry much less to the development of some of the younger players. At this point, Westbrook is a better PG then Collison. I'd like to see him take over PG position permanently next year with Jrue playing SG and hopefully Shipp at 3. Westbrook in a lot of ways may get the nod over DC. But 40 min. of making good decisions and distributing the basketball, I'll take DC. what makes everyone so sure that Westbrook still be at UCLA next year? I don't think Westbrook is a threat to bolt early to the NBA. He's still a "tweener" and needs to develop his game if he wants to be a 1st rounder. He's not a natural point guard and is still on the small-side for a 2-guard. I think he projects to be a Gilbert Arenas-type guard who needs to refine his outside shooting to shoot up the draft boards. If he stays to develop his game, he'll be a lottery pick by the time he leaves campus. Brad... the 95 Bruins were one of the best TEAMS I have ever seen. It might not have been loaded with NBA talent, but the pieces worked so smoothly together and was on the same page emotionally and mentally due to the steely senior leadership of King Ed, Tyus, and Big Z. We'll revisit this question if this year's edition is able to win 31 (32) games and hang another banner in Pauley. Can we get an update on Collinson? Did he practice today? Will he be 100% ready for the Washington game? We really need another sweep this year to show that this team is serious! I meant, we need another sweep THIS WEEKEND, to show that this team is serious. I had the fortune to be a student at UCLA during that 94-95 run and I would have to agree with David G. That was definetly one of the BEST teams I have ever seen. Like Big G. said above, not so loaded with NBA talent, but the chemistry they had - WOW! David, Good observation. I see this team not being as good offensively buy just as athletic, and better defensively. Looking at the possible matchups is fun, with Ed being a big advantage for the 95 team. Maybe, the 95 teams only advantage. Which projects this team to have verrrry good fortune in the post season. I'm calling my shot guys! Ben Howland!! vs. Jim Harrick?? Also, you're comparing one team still developing with a finished product. Also, no matchup for Prince Luc?? An interesting idea, however, one to possibly revisit in April. Although I don't think Harrick really ever got his due for winning the 95 championship. Peter Dalis, the AD at the time, wasted the opportunity to capitialize on that championship because he had a personal vendetta against Harrick. Man! How did I forget Luc? I think Big Ben would put Luc on Ed O'bannon. I like Ben in the coaching matchup. But on the 95 team Harrick did a masterful job and his assistant coaches were his best ever. Howlands staff is really good. Who were the assistants in the Lavin Era? Yes I agree with the above comment. Peter Dalis did have a personal thing against Harrick which cost UCLA many great recruits and chances for more championships. Arizona and Stanford benefitted from such a personal vendetta. Harrick was wrong in what he did but fired? NO way! Imagine this.... Had Harrick not been fired, Ucla would have and potentially have a line up Baron Davis, Lamar Odom, the Collins twins, and Toby Bailey and teh freshmans from the 95 class. You recall Odom went with Harrick to Rhode Island and the Collins twins ended up changing their minds and going to Standford. Wow DB, good analysis! Very interesting take on Harrick's demise which led to the era of Lavin mediocrity. I know it's early, but will anybody join me and drink to that? Do you work? Student? How is it that you can begin EVERY day drinking beer at 8 am? UCLA would not have had Odom. 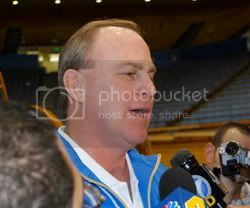 When Harrick was fired from UCLA and hired at RI he then hired Jerry DeGregorio as an assistant coach at RI. DeGregorio was Odom's high school coach. After Odom decided to transfer from UNLV because of his infractions DeGregorio brought him to RI. when collison gets back in 'rythum', which might take 2 weeks to a month, as long, like coach says, as he keeps shooting that short pull-up, he will make the bruins a great TEAM. Next year could be greater if no underclassmen leave early and the bruins recruit one more quality big man. they will become a terror on defense by pressing non stop full time.